“BEST REVIVAL OF A PLAY” WINNER! “BEST PERFORMANCE by a LEADING ACTOR in a PLAY” WINNER! Read the NY Times review here. Official website here. Also in June 2007 Jenkins and Dallas Summer Musicals were bestowed with the incredible honor of winning the 2007 Tony Award® for Best Special Theatrical Event for Jay Johnson: The Two and Only. BOEING-BOEING When BOEING-BOEING took off to a roar of laughter in 2007, it was crowned “The funniest show on the London Stage” by the Daily Telegraph and quickly became the first-class champagne toast of the town. Now this Olivier and Evening Standard Theatre Award-nominated production of the classic comedy is coming in for a landing on the Great White (Run)Way! The new Broadway cast Includes Tony® and Emmy® Award winner Christine Baranski (“Cybill”), Emmy® winner Bradley Whitford (“The West Wing”), Gina Gershon (“Ugly Betty”), Kathryn Hahn (“Crossing Jordan”) and Mary McCormack (“The West Wing”). Reprising his star turn as Robert is acclaimed British actor Mark Rylance. In BOEING-BOEING, Bernard, an architect living in Paris, has been successfully juggling three fiancées who are all flight attendants. Bernard’s housekeeper reluctantly plays romantic air-traffic controller as they fly in and out of his swank bachelor pad. But when an old college pal visits, things get rather turbulent! Schedules change, flights are delayed and chaos ensues in this hysterical, high-flying fiancée fiasco! Dallas Summer Musicals, presented by Comerica Bank, is proud to have been bestowed with the incredible honor of winning the 2007 Tony Award for Best Special Theatrical Event for Jay Johnson: The Two and Only. The Tony Awards are Broadway’s longest-running salute to theatrical excellence, both on stage and behind the scenes. On June 10, Tony Night was a celebration of the Best of Broadway. So, it was only fitting that DSM’s President and Managing Director, Michael A. Jenkins, joined the esteemed group of Broadway and Hollywood stars on stage to bring not just one, but two medallions back to Big D! Mr. Jenkins accepted a Tony Award both on behalf of DSM and for himself as a producer of the award-winning show. The DSM medallion is proudly showcased in the lobby of its rightful home at The Music Hall at Fair Park. As a visionary leader in Dallas’ entertainment community, Jenkins’ has consistently brought the “Best of Broadway” to Dallas Summer Musicals. This season, will be no different with a sensational line-up featuring more shows than have ever been offered in the organization’s history. To kick off the season, DSM will bring the Tony Award winning production of Jay Johnson: Two and Only to Dallas as the first show in the Broadway Contemporary Series. About The Tony Awards The Antoinette Perry “Tony” Awards are bestowed annually on theatre professionals for distinguished achievement. The Tony is one of the mist coveted awards in the entertainment industry and the annual telecast is considered one of the most prestigious programs on television. 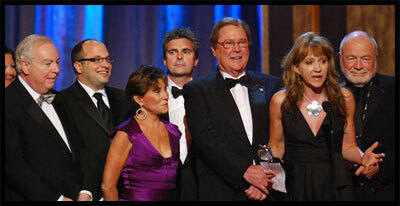 The Tonys are presented by the League of American Theatres and Producers and the American Theatre Wing. About the Medallion In 1949 the designers’ union, United Scenic Artists, sponsored a contest for a suitable model for the award. The winning entry, a disk-shaped medallion designed by Herman Rosse, was initiated that year at the third annual dinner. It continues to be the official Tony Award.During the first two years of the Tonys (1947 and 1948), there was no official Tony Award. The winners were presented with a scroll and, in addition, a cigarette lighter (for the men) or a compact (for the women).